Palms sweaty, arms heavy, and legs feeling like spaghetti. An anxious person is running relentlessly, not looking back for anything or anyone. It might sound like something from a track event at the Olympics, but no, it’s a customer on Black Friday. Many people each year decide not to go shopping on Black Friday because of the traffic and hoards fighting over the latest headset. In reality, everyone should consider going on wild shopping sprees the one time a year many stores make unimaginable discounts. With prices insanely dropping, items in popular stores such as Target, and Best Buy will be made way cheaper. Products previously being sold at high prices will then be more affordable for average people to go ahead and purchase. There’s nothing like bringing home a large flat screen tv for a fraction of the original price. 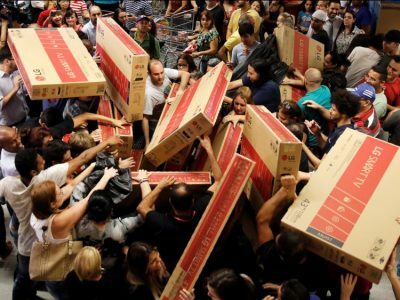 If anybody is in need of some exercise or feels bad about all the hot cocoa they’ve devoured lately, then there’s no need to worry because Black Friday is near. Who needs a gym membership when they’ve got the opportunity to speed walk across their nearest department store stuffing their cart full of things they don’t need. With the consistent pacing and running around from place to place, they get to let go and become the skinny legend they were meant to be. Sleeping in tents right outside the store for hours or days at a time is absolutely worth it. It’s a rare opportunity to sleep somewhere other than a parent’s house not doing chores more stressful than GPA’s. People might catch hypothermia from the freezing temperature, but they’re here for a good time not a long time. Overall there might be consequences with purchasing mass quantities during Black Friday, but the memories are worth it. Besides bringing a few dozen new gaming consoles home with gawking family members is definitely a plus. It may also be the last chance to walk into a Sear’s store.